Peter was born c.1882 in Edgeworthstown. Prior to the war, Peter was a carpenter, as was his father and his brothers Philip and Edward. Peter was married to Mrs. Katie Kiernan of Church Street, Edgeworthstown, and she is named in his will as his heir, (link below). They had at least one daughter together, called Kathleen. 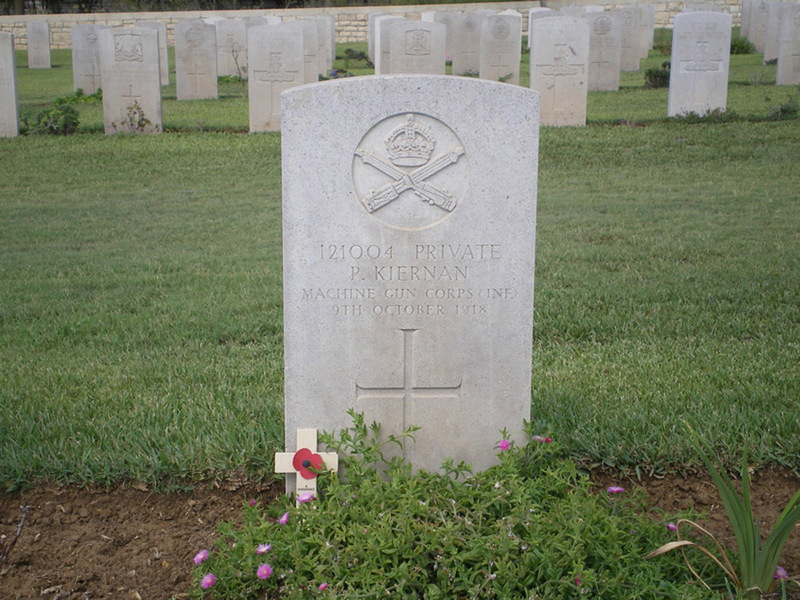 10th Field Hospital, Palestine - Dear Mrs. Kiernan; It is with deep sympathy that I write to break to you the sad news of the death of your husband. It was only on the 6th inst. that he complained of feeling unwell. He saw Batt. M.O. [battalion medical officer] who relieved him of duty. The following day he paraded as usual and appeared to be in his usual health. The next day - the 8th inst., he had a very high temperature and the M.O. sent him to Hospital. 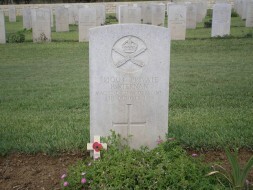 He died of Malaria (M.T.) at the 77th C.C.S. [Casualty Clearing Station] Ludd [modern-day Lod] on the 9.10.'18. Your husband has been wheelwright to this Battalion since its foundation. He was always happy and smiling, and always had a good word for everybody, and I know we have lost a good, capable and efficient soldier. Please accept from the officers and men, their deepest sympathy in this your great trial. - John. F.L. Lamport Lt. T.O. 60th M.C. Battalion. Son of Philip Kiernan, Edgeworthstown. Peter died on the 9th of October, but his will lists it as being the 10th.